The common tests used in determining reflux, its severity and confirming that there are no other GI issues are pH Probe, Upper GI, Endoscopy and Swallow Study. Both Will and Jack have had all of these done. This test is used to determine if a child has reflux and its severity. A probe is inserted in his nose and down into his esophagus (above his stomach) and measures the acid levels and changes for 24 hours. The newer probes can measure the acid and reflux at 2 points in the esophagus. Usually this test is run with the child off of their medicines for at least 4 days. Seattle Children’s requires that children under 5 have to stay in the hospital overnight. Jack had 2 pH Probes. Both of which came back inconclusive. They showed he did reflux, but didn’t show significantly high acid levels. His first probe was completed when he was 2.5 months old. We did the probe on a quick turn, so he wasn’t off of his meds for the 4 days. He was only off of them for 2 days. The second time (6 months old) he was off of his meds for the 4 days and already had his feeding tube. We did it as part of an endoscopy to have a complete study at that time. Will had a pH probe at 5 months old. His was different because we did it with him on his meds. We wanted to see if he was still having acid come up. He had 31 incidents of reflux and one lasted for one minute. These results were considered normal. Due to our experiences with pH probes we don’t find them useful completed in the traditional sense (without meds). It can be a useful test to show if the child is still having acid breakthrough with their meds. The Upper GI is used to show the anatomy of the Upper GI tract (esophagus, stomach and upper small intestines). During the test the baby drinks a bottle of barium and the doctors watch it using a fluoroscope traverse down the esophagus into the stomach and through the stomach into the upper small intestine. The doctor is looking at the anatomy to make sure nothing is twisted, in the wrong place or any blockages. They can see reflux during this test. 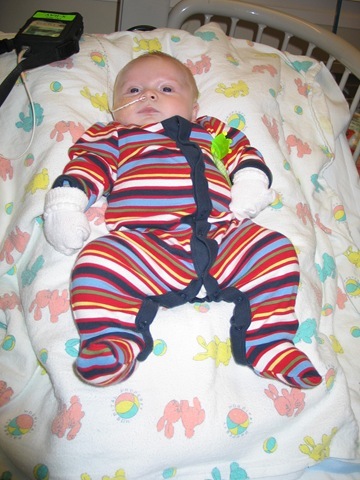 Jack had his upper GI at 2.5 weeks old. It was during this test that we first realized that he had reflux, since he was a silent refluxer and did not spit up. His anatomy was normal. Will’s upper GI was at 5 months old. His test was normal. An endoscopy is probably the hardest test for parents to have done on their baby, because the baby has to go under anesthesia. That is why we delayed Jack’s for so long; we were fearful of putting him under. Once the baby is asleep a camera is sent down their throat into the esophagus, stomach and upper small intestine. The doctor is looking for an signs of inflammation or irritation. During the test small biopsies are taking from all areas to make sure there isn’t any inflammation that isn’t visible to the eye. 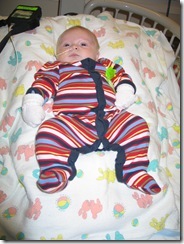 Jack’s endoscopy was at 6 months old. By this point he had his feeding tube and was on Neocate formula for his milk protein intolerance. The test as normal. Will had his endoscopy at 5.5 months of age, after he had a dip in his eating and we were concerned he might have lingering acid and irritation. The results were normal. In our opinion this is one of the most useful tests and we wish we had done an endoscopy earlier for Jack. It may have shown the irritation that the formulas were causing him. It may not have changed his outcome, but we might have figured things out sooner. This test confirms that the baby can swallow effectively and not aspirate any liquid into their lungs. They test thin (regular thickness formula) and thickened liquid. It is done using barium and a fluoroscope similar to the Upper GI. The baby sits in a seat that is similar to a car seat and fed the bottles while the doctor watches on the screen. Jack had his swallow study at 4 months old. It was normal. Will was 5.5 months old for his swallow study. He showed penetration into his trachea, but not actual aspiration of the thin liquid. He was able to control the thickened liquid and keep it out of his trachea. By this point he had been on thickened formula for ~3 weeks. He will be retested in 2-3 months. Another test they can also do is a Stomach Emptying Study, if it is believed that the child might have a delay in the speed that their stomach empties. Jack had this test and it showed a mild delay in emptying.